The City of West Hollywood’s Halloween Carnaval will take place on Wednesday, Oct. 31 from 6 p.m. to 11 p.m. along Santa Monica Boulevard between Doheny Drive and La Cienega Boulevard. Street closure information is available on the City’s website at www.weho.org/halloween. 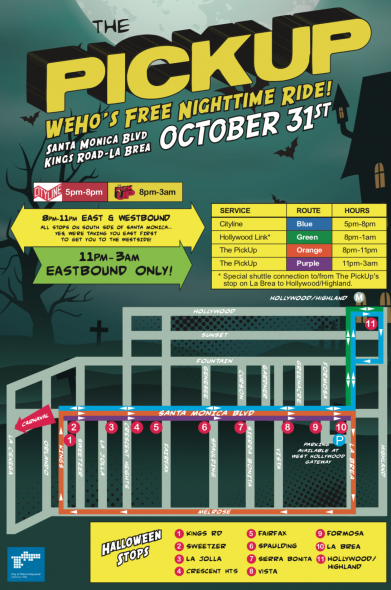 Due to street closures, there will be modifications to Cityline Local and Cityline Commuter routes on Halloween day — details can be found at www.weho.org/cityline. Cityline (Modified Service) — Cityline Commuter, which connects riders to and from the Metro Red Line Station in Hollywood, will run a modified route between Hollywood and Highland and Santa Monica Boulevard/Kings Road from 5 p.m. to 8 p.m. The PickUp (Special Service) — The PickUp will run from 8 p.m. to 11 p.m. along Santa Monica Boulevard and will stop at all regular eastbound stops between Sweetzer Avenue/La Brea Avenue. Once the PickUp reaches its La Brea Avenue stop, it will take an express route west toward the Halloween Carnaval via Melrose Avenue to its special Halloween stop on Kings Road/Santa Monica Boulevard. From 11 p.m. to 3 a.m., The PickUp will only run eastbound from Kings Road/Santa Monica Boulevard to La Brea Avenue/Santa Monica Boulevard.